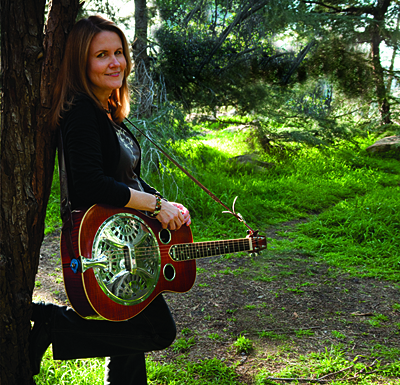 Resophonic guitar player, vocalist and songwriter Paula Lane lives in Southern California by way of Jacksonville, Florida. She has played with several bands, including This Just In (current), High Cotton and Misbehavin’ and has done a movie soundtrack. Paula and her husband Dwayne are generous in holding many music events at their home in Lakewood. When she’s not writing songs or playing music, Paula works in the intensive care units at UCI Medical Center as a respiratory therapist. She also has a photo restoration business. You have written many of your songs from actual experiences; what is your process for translating “real life” into the phrases and stories that hold their own in the sparse language of songs? A lot of great songwriters begin with a title or a melody, but that technique often does not work for me. When I write, I usually have a subject in mind for the song and in most cases, this is a true life experience or an story of someone that I know and something that has a personal meaning to me. I write down ideas and phrases of the story line and keep them in a word document on my computer. I pick and choose the best of these phrases and they eventually evolve into a song. Sometimes this happens in one day or in some cases, weeks. Once I have the lyrics, the song just leads me in the direction that it wants to go. I can’t always say that I want to write a waltz or a fast song because the lyrics usually dictate the tempo and the mood of the song. My next step is to sing the song along with either regular guitar or resonator. That helps me to come up with a melody. I experiment with different chords and structure my song so that it compliments the words. 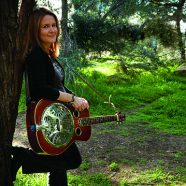 Often I tune my resonator guitar to DADGAD tuning because I love an old time, bluesy sound to compliment certain lyrics. That is the instrument I play with the band I am in and I use it a lot to set the mood of the song. Sometimes after I write a song, the song names itself. Often there is a line in the song I have just written that repeats itself and it seems appropriate that it should be the name of the song. Why do you write original music? For a long time, I played cover tunes. There are a lot of great songs written by other artists and I enjoy playing and singing them. But people like to express their own feelings and writing a song is a good way to accomplish this. You are talking in your own voice rather than imitating someone else. You can make your song anything that you want it to be and there is something very rewarding about that. Besides that, someone in the band has to do it! It may be wishful thinking, but I’d like to believe that someone will listen to these songs years later and remember these stories which would otherwise be forgotten or remember a character that I have sung about. What is the very best part of presenting an original song you have written to others? Like a lot of people, I tend to be critical about my own writing, but when I get a positive reaction from the audience and they can personally relate to my song, I know that I am on the right track. My band members have been very supportive of my writing and it is very exciting to hear other people add harmonies and instrumentation to your own original song. It adds another dimension to the song and brings it to life. Several years ago, I decided to research my family history. They say that if you dig deep enough you’ll find some interesting stories and I certainly found that to be true. One of my relatives mentioned that there was a murder in the family and that captured my interest. I did some investigation and found some newspaper articles about this incident. Harry Lee was my mother’s first cousin but since he was born in 1895 and much older, she does not remember him. In 1914, when Harry was only 19 years old, he went to work for his uncle in a bakery in Hawkinsville, Georgia. He claimed that his uncle did not treat him well and would not give him money to go home on. One night, while his uncle was sleeping, he brutally murdered him with an axe. He went to prison for this crime but was later released. Since there are a lot of murder ballads in bluegrass music, I thought this would make a great song. At the very end of the song there is a line that says “Often times I sit and think about my family tree, and wonder if there just might be a little Harry Lee in me.” So now there’s a running joke in my band that my husband won’t let me keep any hatchets in the house! What are the most significant things you’ve noticed or learned about songwriting that might help other songwriters? When I first started writing, I felt that I had to tell the whole story. Later I learned to leave out some of the details of the story and leave something to the listener’s imagination. It’s ok to be a little vague and let the listener create the outcome of the song. You can learn from other people, but don’t try to copy. It’s good to be different. There are no specific rules. You’ve done an amazing job with these interviews. I browsed through your blog and have found your posts really interesting. In fact, I am personally fond of this idea and I write a blog very similar to this concept. I do see that you haven’t had any updates since 2009. I have started realizing with my own blog that it is hard to get people’s attention with this kinda of a concept. Unfortunately, they are not open to the idea of songwriters sharing their creation while the songs are in the making.